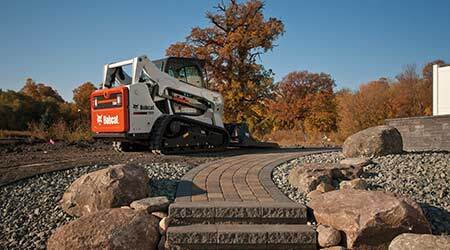 Light construction equipment, including skidsteer loaders, expand the capabilities of grounds departments undertaking upgrades and improvements to landscapes. Many grounds departments regularly undertake light construction projects around their facilities, whether to upgrade or expand landscaping or repair utility equipment. The work often calls for managers to rent specialized equipment to ensure an efficient and successful project. By understanding options for light construction equipment — including backhoes, skid steer loaders, and forklifts — and the related training and safety issues, managers can make smart specification decisions that meet the needs of both equipment users and organizations. The most common pieces of light construction equipment offer managers and operators a range of sizes, features and capabilities. Understanding the differences among these options enables managers to select equipment that best suits the specific project. Backhoe loaders. These pieces of equipment feature a shovel on one end and a bucket loader on the other. They are used primarily to open and close trenches for pipe and power transmission lines and for pipe placement. But they can be used for work that includes ditch clearing, site clearing, hauling and demolition. Loaders can use other attachments, including brooms, backhoes, augers, compactors, and trash pumps. Mechanical and pilot control options, move all control to ergonomically designed hand-operated layouts that give operators a better feel, eliminating foot pedals, as well as improving productivity and fuel efficiency. Operator controls include low-idle mode, which reduces noise and enables better communication with others on site. Skidsteer loaders. The Association of Equipment Manufacturers recognizes seven classes of skidsteer loaders based on rate operating capacity from up to 1,251 pounds to more than 2,701 pounds and from 50-70 horsepower and above, both tracked and wheeled. These loaders are highly maneuverable, and the standard attachment is a bucket. With other attachments, workers can use them for brush clearing and log splitting, and with a fork attachment, they can serve as a pallet, skid, or construction material transporter. With the addition of a trencher attachment, a loader also can serve as a backhoe. Dual steer levers control the drive functions, while dual foot pedals control lift and tilt. Another option is hands-only control. The operator pulls hinged lever handles back or pushes them forward for boom and bucket control respectively. With the bucket tilt on the right side, the operator pushes out to dump and pulls in to rotate the bucket up. Skidsteer loaders make tight turns by drive wheels or tracks on one side turning slower — inside — than those on the other side — outside — of the turn. They can pivot on the inside track , which can churn up grass and other landscaped areas, so the operator needs to make wider turns over these surfaces. Forklifts and aerial lifts. These units can be powered by AC or DC electricity, fuel cells, gasoline, LP gas, and diesel fuel. Featuring hard or balloon tires, they range in capacity from less than 3,000 pounds to more than 70,000 pounds, and primarily move workers, tools, and materials horizontally and vertically on construction sites. AC-powered forklifts are surpassing DC units because of AC’s advantages, including longer life, lower maintenance, greater acceleration, and quicker response. Their finer-tuned motor controls give operators a smoother feel, and less maintenance means more productivity. For larger fleets, this translates into fewer forklifts for the same work. While the initial cost of AC-powered units can be high, their life cycle costs can be lower. Hydrogen fuel cells soon will be driving this equipment, and here’s why. Hydrogen production, transportation, and charging — which can take only a few minutes — can be done using renewable fuel with no carbon dioxide emissions. At the construction site, hydrogen fuel cells use a chemical reaction producing only water vapor and no carbon dioxide emissions with very little noise. With no electric battery to charge, the equipment utilization is much higher. The rider forklift operator uses either hand controls on the steering column or foot pedal transmission controls to select park, drive, and reverse. As with a car, other controls include accelerator, brake, clutch pedals, and parking brake, as well as an inching pedal for more precise movement in spaces that have little room to maneuver. On hydrostatic lifts, the operator moves the unit forward with one pedal and shifts a foot to a second pedal to move in reverse. Aerial lifts are specialized units that substitutes a personnel platform or bucket for the forks. Various-sized platforms with extensions provide a space for workers, tools, and equipment. Accessories include hookups for electric- and air-powered tools and welders. An aerial lifts’ dual controls allow the operator to maneuver it either from the platform or from the ground. With so many possible configurations, it is essential to have training and the operating and maintenance manual covering each specific make and model forklift.